Ultimate Nutrition changes the way you regard Whey Protein Isolate (WPI) by presenting you with the best-tasting and most isolated whey shake ever formulated – Iso Sensation 93! Iso Sensation 93 is a true protein sensation as it provides your body with 30g of IsoChill Whey Protein Isolate per serving. IsoChill is a Double Cold-Temperature Processed Cross-Flow Full-Spectrum Premium Microfiltrated Whey Protein Isolate that has yet to be matched when it comes to pure protein content, amino acid profile and absorption rate. With 0 fat and less than 1 gram sugar per serving, Iso Sensation 93 is the purest and most isolated protein in the market, offering 93% Whey protein content, compared to other Whey Protein Isolates that can go only as high as 90%. Iso Sensation 93 is perfect for those trying to build lean muscle or lose weight while maintaining lean muscle. Iso Sensation 93 Whey Protein Isolate and speeds up muscle repair after exercise, greatly reducing recovery time. Your recovery speed is further enhanced by an exclusive Glutamine Complex (Glutamine Peptides, Glutapure Glutamine and N-Acetyl L-Glutamine) that restores glutamine reserves after exercise. With Iso Sensation 93 you also get an SI Complex (Alpha Lipoic Acid, d-Pinitol and 4-Hydroxyisoleucine) which provides antioxidant support. To ensure that your body digests Iso Sensation 93 perfectly, it contains a D Complex (Protease and Lactase). It’s time to taste the protein sensation that is revolutionizing the sports nutrition industry... 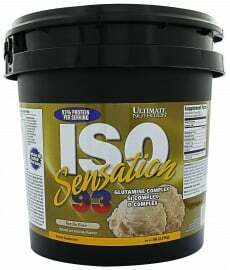 Ultimate Nutrition Iso Sensation 93! Have a question about Iso Sensation 93? What is it, what does it do, how and when to use or something else? Ask us. “Iso Sensation 93 910g” is currently out of stock. Enter your details below and we will let you know when it's back in stock. Other Ingredients: IsoChill® (Double Cold-Temperature Processed Cross-Flow Full-Spectrum Premium Microfiltration Whey Protein Isolate), Colostrum, Glutamine Complex (Glutamine Peptides, Glutapure® Glutamine, N-Acetyl L-Glutamine), SI Complex (Alpha Lipoic Acid, d-Pinitol, 4-Hydroxyisoleucine), D Complex (Protease, Lactase), Natural and Artificial Flavors, Lactoferrin, Acesulfame Potassium, Sucralose and Soy Lecithin., Contains Milk, Soy and Wheat.